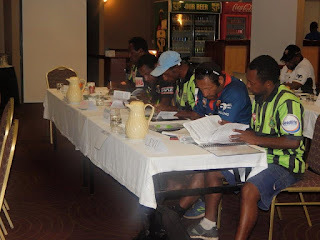 The PNG NRL in conjunction with the PNG Rugby Football League has conducted a referee workshop purposely to educate local based referees to uplift their standard, when refereeing rugby league matches in the country. The workshop is conducted by the Richard Johnston Referee Development program, and is currently attended by fourteen referees from various league playing provinces, who are affiliates to PNG RFL. Speaking at the conference today, coordinator Richard Johnston says this is another milestone agreement which will definitely pave way for local referees to learn has much, in order to step up their skills of refereeing. He says PNG has the skills of potential referees at international level; however we need more clinics like this, which will enhance our local referees to exposure at national level. He further added that it is also vital to conduct referee clinics in rural areas, so that we pass on the message to potential young people who are willing to take up match referees.